More and more and more…CRM Idol reviews keep coming. Here are three more from the last few days of judging. Please feel free to comment here on them. This round, Relenta, RightAnswers and Connected. Relenta is an interesting company, with a product that can stand on its own, but, as we will discuss later, might be better suited elsewhere. Founded by a highly experienced and successful entrepreneur, Dmitri Eroshenko, in 2004 and in beta by 2005, they showed a good enough value proposition around their “simplicity” mantra to capture their first commercial customer by 2006 and went to breakeven and debt free by 2010. While the range of users per company is from one to sixteen, the average number of users is “2.5.” Their pricing model is subscription based. It ranges from a very small freemium model to a 30-user, lots of everything else, $250/month plan. Regardless, what Relenta does seemingly quite successfully is to take social data channels, emails and the traditional CRM transaction records and activities and aggregate the data in ways that are useful to what is primarily a sales person from what we were able to see from the Relenta demo. Aside from presenting traditional contact and account activity data such as invoices and sales history, it can incorporate social data in ways that are highly beneficial such as lead gathering or lead nurturing, or tracking the internal and external actions and interactions of an account or contact. It can pull in data through its pipes from Twitter, Facebook, and email bidirectionally and as you will see in the figure below, incorporate customer activity. That according to Dmitri, includes, “DMs” meaning Twitter direct messages though how that would work without permission is a bit of a mystery at this point. Also, noticeably absent in this was SMS, e-faxes and a whole host of other communications channels that are used by sales people in the 21st century. Relenta’s aggregation and integration of the data sources that they do provide for this unified inbox is effective in its ease of use. Because of its open source architecture, being built with Linux, Apache, PhP and MySQL, how you use the system is flexible, and, in this case, somewhat customizable. This architecture’s open-endedness will allow it to be integrated with other like systems such as open source CRM systems (e.g. SugarCRM) or those like salesforce.com which allows for this kind of integration even though built on a different architecture. This fact has some bearing on some of the conclusions as you will see. Relenta has what they call a “holographic system” which means that with their interface you can be in the CRM system, the email system or social channels and still be in the other systems though interfaced with one of them. How this is holographic we’re not sure, but the point is well taken. Since Relenta drives for simplicity, lightness and one-click accessibility, this is a critical facet of their value and their differentiation. They claim 90% of the functionality (of CRM?) with 10% of the application weight. While that’s a bit of a stretch, again, the idea is a good one for their target markets, which are small businesses and small workgroups within larger businesses. For example, you can, after a tweet is discovered that is associated with a contact in your system who might have an active deal, read the tweet, dig out the deal information – available from wherever you are with a single click and then develop a response. It also provides you with the ability to tag the contact, or any other area for that matter, so that you can see other tag-related activity associated with that descriptor. While Relenta says 90% of the functionality at 10% of the application load, it actually is closer, at least in CRM terms, to 25% of traditional CRM functionality. It really doesn’t natively provide sales functionality like opportunity management or pipeline management or the dashboards that managers even of small teams might need to see how their sales teams and staff are doing. On the customer service side, what it provides really is something like find a twitter complaint, respond accordingly but it is a simple action reaction etc. kind of system. Not any real customer service functionality, at least from a CRM standard. 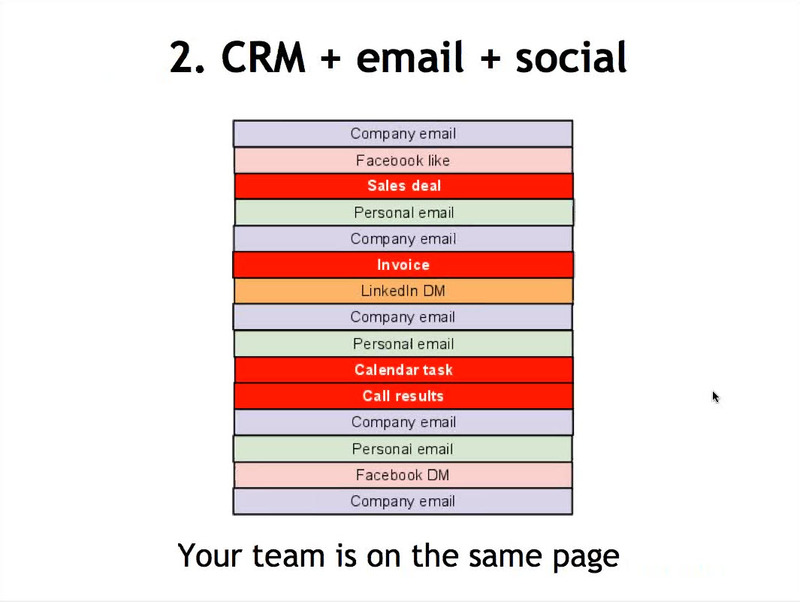 And this is CRM Idol, after all. But this doesn’t mean we are dealing with a bad product, just one that is extremely light on traditional CRM functionality. What it does very well, is enrich the functionality available to what is just usually the back and forth of an activity stream. For example, you can not only show the deal that’s being discussed in the activity stream but also the contact history so that you have much more information at your fingertips when you are collaborating, making this a good product for small groups – with the caveat below. For a very small businesses – those that average 2.5 users – Relenta works as a rich but simple SFA-lite system. Since his roadmap incorporates pipeline management (according to their website, “coming soon.”), they are obviously interested in building the standalone sales functionality out a bit more than it currently supports. But for small workgroups in larger companies, they would be best suited as an integrated engine that would enrich the workflows, simplify the sales person’s job and provide an increased useful value for the data that those small workgroups need – from other CRM systems. While they integrate with Freshbooks, integration isn’t a strong focus for them. It should be. They are very good at what they provide, and would be even better if they could provide it as something interwoven into multiple existing CRM systems. Small businesses typically have few choices when configuring their systems. Either a small business takes out of the box functionality and learns to live with it or the company can invest its resources in customizing software to meet its needs. Larger companies have the same issues but their deeper pockets and greater resources make the customization route viable. Of course, any business can also fall back to using spreadsheet applications but that solution has its downside which has been well documented. GreenRope tries to provide a third path. Founded in 2000 and located in Soland Beach, CA, the company offers something like a Swiss Army knife approach to business software for small businesses and consumer groups. GreenRope may not match other CRM products feature for feature but given its audience, it doesn’t have to. It provides an eighty-percent solution that combines CRM, social media, email marketing, surveys, event and project management, website content management, ecommerce and a private wiki. There’s more than enough here to enable a small business to compete in the marketplace. The big benefit for customers is that, as a platform for so many business applications, GreenRope can synchronize data and help coordinate various business activities thereby helping its customers to save money over point solutions and keep issues from falling through the cracks. Corraling business information helps the small business to keep more balls in the air and compete more effectively. GreenRope has been around for more than a decade and as yet, has not taken any outside capital. The founders’ roots are in email marketing and the product set is built around the assumption that email is an important channel for small businesses. Homogeneous consumer groups – associations, alumni and similar organizations – that have affinity among their memberships will frequently see this email approach as good and productive where others might put up the spam filters. The product is highly configurable enabling even a small business short of technical expertise to still be able to modify its behavior. For more technical audiences the company also offers code access. The product runs a LAMP stack (Linux (operating system), Apache HTTP Server, MySQL (database software) and Perl/PHP/Python using both Perl and JQuery for applications. GreenRope’s approach to the market also includes a VAR channel and private labeling so that associations can offer the product as a benefit of membership to members. Historically small businesses first bought accounting software to manage their books and when business picked up a contact manager. Today multichannel customer access and a greater dependence on doing business online or through other indirect channels make it imperative for many small businesses that they find more efficient ways to bring their channels together to serve their customers cost effectively and efficiency. The GreenRope suite is a good step in that direction. GreenRope has taken its organic growth approach about as far as it can. It is not the only CRM product attempting to address the small business market and that market could benefit from the richness and simplicity GreenRope offers. The company now needs to get better known and reach out to the market which may mean taking on outside capital and the structure and advice that comes with it. GreenRope may not match other CRM products feature for feature but given its audience, it doesn’t have to.It provides an eighty-percent solution that combines CRM, social media, email marketing, surveys, event and project management, website content management, ecommerce and a private wiki. There’s more than enough here to enable a small business to compete in the marketplace. GreenRope has been around for more than a decade and as yet, has not taken any outside capital. The founders’ roots are in email marketing and the product set is built around the assumption that email is an important channel for small businesses. Homogeneous consumer groups — associations, alumni and similar organizations — that have affinity among their memberships will frequently see this email approach as good and productive where others might put up the spam filters. It’s a common story with emerging companies almost bordering on a cliché. The founders have a bright idea, maybe get some funding and try to bring their idea to the world. Often the world ignores the idea or if the innovator is lucky some early adopters pick it up and run with it though they will likely change the idea considerably along the way. Connected (www.connectedhq.com) has all of the elements of a typical startup story plus one. Founded in 2010 the company launched its social CRM product in early 2011 with the help of angel investors Trinity, Ignition and 500 Startups. Founders Sachin Rekhl and Ada Chen Rekhi envisioned “SocialCRM Without the Work” and that is where the wheels could (but don’t) fall off. The plus one referenced above goes like this. Connected is not a very useful bit of CRM. The Rekhls envisioned a solution to the CRM adoption problem last seen in an off the cuff comment by an analyst many years ago that still lives in mythology. The Rekhls contend that the problem with CRM adoption is that CRM requires a great deal of data input before it can be useful and that many users balk at the data entry. True enough but the same can be said of ERP in spades but you never hear of anyone tiring of plugging in those dollars and cents. It says something about our respect for existing money and our imperfect understanding of future money that CRM is supposed to help us get. At any rate you can’t have CRM without data and it isn’t all going to come in via osmosis, especially when you consider deal and other transaction data. But all those shortcomings in Connected can easily be ignored if we simply ignore the founders’ initial positioning. Connected has no conventional CRM back end and isn’t really CRM but it is a superb contact manager. In fact to call Connected a contact manager is to redefine the category. If Connected manages contacts, other products merely warehouse them. The heart of Connected is a Universal Address Book that Hoovers (as in a vacuum) in social and other relevant data from a growing list of social sources that includes Facebook, Twitter, LinkedIn, Yahoo, Email, blogs and much more. Connected keeps you abreast of all the social meanderings of all your contacts and reminds you of things you need to know in business. Someone was promoted or changed jobs or that already old chestnut, somebody has a birthday today – Connected tells you without your having to search so that you can presumably do the right thing. Connected has what the company calls Comprehensive Profiles so if there is something on the Net about one of your contacts you can reasonably expect it will show up in your Connected account. Same goes for companies you want to follow. If think there’s too much data and not enough information, the company has already reached the same conclusion and built a prescient Daily Agenda function – a daily email about your meetings and their context, recent status updates, reminder of all previous meetings. It’s the equivalent of your personal daily briefing. This is significantly valuable for sales people for instance preparing for a busy day or commuting to a meeting. Just don’t try to drive while you’re digesting it all. Daily Engage Events goes deeper to inform you about what’s happening in the lives of people around you, i.e. the birthdays etc. So, ignoring the positioning, the founders have delivered on most of what they set out to do. They’ve built a tool that collects and presents a great deal of social information about your contacts without imposing the data capture on the user. Of course capturing and using transaction data is still an issue and it will be solved as Connected gets connected to conventional CRM products in the months ahead. More likely this company is well positioned (in San Francisco of all places) to be scooped up by some smart and more well established CRM company that understands the value of social media in CRM and the overarching requirement to seamlessly integrate social and CRM. Who might that be?